Location: Western Massachusetts, near Charlemont, just 2 1/2 hours from Boston. 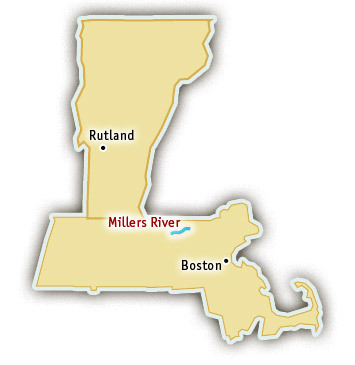 Although its headwaters are in southern New Hampshire hills, the Millers River spends most of its journey in Massachusetts, flowing through mining towns and beautiful New England forests, and ending in the French King Gorge, where the Millers joins the Connecticut River. Just a couple hours drive from Boston and New York City, the Millers River is an easy weekend adventure or a great reason to play hooky from work. Zoar Outdoor– Offering a wide range of outdoor activities, Zoar Outdoor has been a leader in the industry since 1989. Zoar Outdoor promotes self-propelled, low-impact, wilderness recreation in the Northeast. Zoar Outdoor offers whitewater rafting trips on the Millers, Concord, and Deerfield Rivers in Massachusetts, and the West River in Vermont. Visit their website for more information about Millers River Rafting. The Millers River starts off with an easier Class II roadside section that allows time for raft crews to warm up and get to know one another. Just as the Millers departs from the road, the canyon narrows and the whitewater excitement begins. Roller-coaster waves make rafting on the Millers River a thrilling and fun springtime adventure. After several Class III rapids, the river canyon constricts and paddle crews challenge the Class IV Funnel Rapids, the most turbulent whitewater on a Millers River rafting trip. After making it through the Funnel, the whitewater continues with big waves to ride, diagonals to punch through, monstrous holes to avoid, and a few calm stretches to soak in the gorgeous scenery. A perfect combination of historical scenes and beautiful wilderness mark the Miller River canyon. 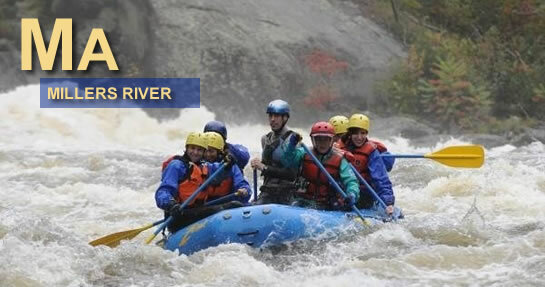 Miller River rafting trips pass through old mill towns that were once powered by the mighty Miller River, displaying a living piece of Massachusetts history. A short distance later, as the Millers River strays from the road and enters a constricted gorge, thick forests of oak and pine make the canyon feel remote and wild. Many animals and birds make this healthy forest their home including ducks, geese, hawks, turtles, deer, and beavers. Silent floats in the calmer sections are often a good opportunity for wildlife viewing. As the saying (almost) goes, “April showers bring…a longer Miller River rafting season.” Snowmelt and spring rains fuel this big-water sprintime rafting trip, so on wetter years, the Millers River can run until late May or early June.